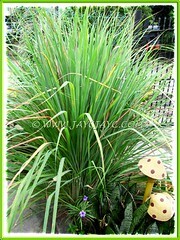 We’ve planted this much-favoured Lemon Grass (or ‘Serai’ in Malay) plant for decades. Just love the distinctive lemony aroma and unique flavour when added to our home-cooked dishes (check out my recipe on Malacca Portuguese Devil Curry that uses Lemongrass, if you’re interested). Many other ways of using this wonderful herb can be found here. Though relatively cheap when sold in markets and supermarkets, we prefer them home-grown as we can harvest them as and when desired! They’re often seen planted almost at every nook and corner in Malaysian gardens or sidewalks as Lemongrass is popularly used as a spice for flavouring dishes in our local cuisine. It’s an essential culinary herb and spice, especially in Southeast Asian cuisines, widely used in Thailand, Indonesia, Malaysia and Sri Lanka. Etymology: The genus name, Cymbopogon comes from Greek words kymbe (boat) and pogon (beard) which refers to the shape of the flower that comprises of a boat-shaped spathe and the many-eared inflorescences which resembles the beard. The species epithet citratus refers to its prominent lemon (citrus) fragrance. Origin: Native to warm temperate and tropical regions of the Old World and Oceania. Plant type: A tall perennial grass that is widely used as a herb or spice in Southeast Asian cuisines, and even used worldwide, namely in the United States, Britain, Europe and Australia where Thai and Sri Lankan dishes are relished. Features: Cymbopogon citratus is a popular species of the genus, Cymbopogon that consists of about 55 species of grasses. An evergreen and fast-growing perennial shrub that has an erect form with a height of about 1.8 m (6 ft) and generally forms a large clump easily about 1.2 m (4 ft) wide or with variable width, depending on the ground space provided. The aromatic linear or straplike leaves at the top are bluish green and are 1-2 cm (0.39-0.79 in) wide, and about 0.9 m (3 ft) or more in length. Beware that the leaves have razor-sharp edges too. The tapering leaf-blades bend downwards to create a lovely ornamental specimen. At the base, each stem or stalk forms a solid bulbous whitish-green section several centimeters long. You can harvest the stems by cutting a section of the clumps, then the roots and the leaves, leaving about 15 cm (6 in) of the lower bulbous portion. This is the section that is sliced or pounded to be used in cooking for its vibrant flavour. 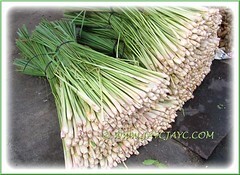 I read that the Lemongrass plant produces flowers too which we’ve never seen before. I suppose the plants that are cultivated do not typically produce flowers. More descriptive features of the Lemongrass plant can be found at Kew Royal Botanical Gardens. 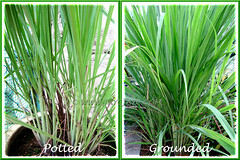 Culture (Care): Cymbopogon citratus or Lemongrass grows easily with minimum care. Light: Prefers full sun for best growth but can tolerate light shade. Moisture: Medium to high water requirements. It enjoys being showered. Soil: Prefers sandy or sandy loam soils. Nevertheless, it is not fussy about type of soil, any commercially garden soil will be fine. Others: Not necessary to fertilize. Prune off dried brown leaves to maintain a pleasing appearance. For subtropical and temperate regions: Hardiness: USDA Zone 10-11. Although a tropical plant, gardeners in colder regions can plant as an annual or bring indoors before the frost as it is frost-sensitive where the leaves get damaged and is killed back to the roots during the cold winter. However, an avid gardener in Zone 8, Jack Scheper of Floridata.com, surprisingly plants it outdoors and claims that it always bounces back after a hard winter. Propagate by dividing the older clumps in spring and summer. Propagation: By dividing the root clumps. Usage: If you like to plant ornamental grasses, a large clump of Lemongrass will look gorgeous in garden beds and borders, or even in tubs and containers. Besides, you’ll get the extra bonus of being able to harvest its stems to be used in your cooking dishes or added to teas, beverages and other drinks for that vibrant lemony fragrance. It’s a favourite addition to savoury dishes with meat, poultry, seafood (as in Tom Yam soups) and veggies. 1. Leaves extract used in traditional medicine, to treat fever, menstrual troubles, nausea and promote good digestion. 2. Contains anti-inflammatory and anti-fungal properties that can be a source of new and safe anti-inflammatory drugs for pharmaceutical companies. 4. A mild pesticide and insect repellent. 5. Essential oil, Citronellol of Lemongrass is used by Beekeepers to attract honey bees. 6. Essential oil, Citronellol of Lemongrass is also used as a presevative for manuscripts in India. 7. Citral and myrcene, active components in the Lemongrass, is used by cosmetics makers. 8. In some regions, it is used in aromatherapy. 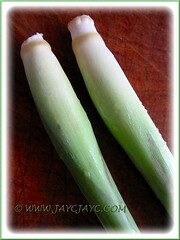 Do try out the flavourful aroma of Lemongrass in your dishes and drinks! Great to know you’ve enjoyed your visit here, Sharifah and thanks for the thumbs-up on our blog,… it made our day! 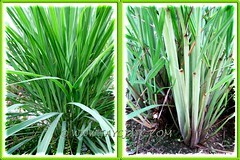 May your Lemongrass continue to bless you with luxuriant growth and be an icon for pleasant memories of home. 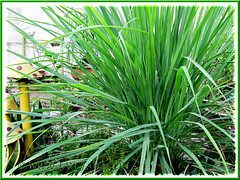 Really lovely lemongrass you have in your garden. What you say is true – they do well when planted in ground compared as planting them in pots. I was not successful in having these in my shaded garden. Guess they really need good sun too. Thanks, James. Too bad that you can’t have them in your garden. What about the sidewalks outside your home where it’s exposed to sunlight… any chance of planting them there? This is a very versatile plant that’d be a great garden addition! I love the scent of lemongrass, and you are right – I have seen them in bloom, strange as the Latin genus name is based on flowers! Maybe other members of the genus flower more? Whoops, Have NOT seen them in bloom, I meant. I think I got overexcited by the curry! Haha… for a moment I thought how blessed you were to have seen them in bloom, Lifera! If you love curries, the Devil’s Curry is a must to try out its wonderful flavour!